Well, folks, this week in the blogosphere we have a guest. The talented Nick Bryan, who I'm certain you will remember from our Interviews With Indie Authors series, is visiting us again from across the pond (okay, he hasn't actually travelled anywhere--such is the magic of the interwebs). 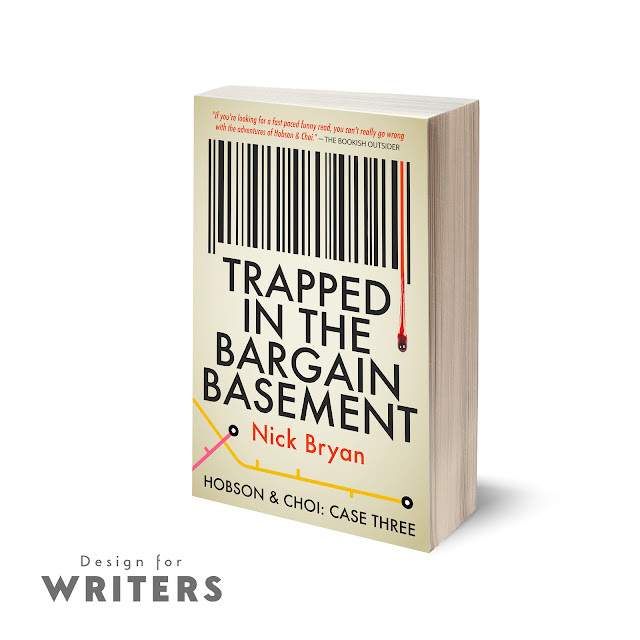 This time, he's launching his third novel in the darkly comic, Hobson & Choi series: Trapped in the Bargain Basement. It goes on sale tomorrow, and I thoroughly recommend it if you enjoy dark humor, unlikely detective pairings, finding the sinister in the mundane, or large, friendly canines that chase down pickpockets. My full review is posted on Goodreads, will be posted on Amazon as soon as is allowed (they're so picky about the book actually being published first... sheesh), and of course, for you, dear readers, is at the bottom of this guest post. 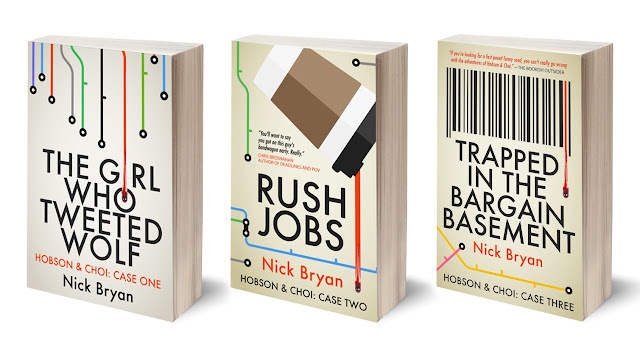 Since generous blog host Virginia is a fellow Jukepop-Serial-into-indie-book butterfly, I thought I’d talk a little about the broad changes needed to transform my mismatched-detectives London crime webserial Hobson & Choi into the three books – The Girl Who Tweeted Wolf, Rush Jobs and Trapped In The Bargain Basement – it has become. Because, yes, it was mostly general editing, but after three releases, I’ve noticed some processes specific to this format-morph. Here they are, in no particular order, just in case they’re helpful to anyone else. In many ways, this first one is a restatement of old classic writing advice SHOW DON’T TELL, but in serials, a certain amount of re-telling can be good. You’re reminding readers of something they hypothetically read months ago, whereas most consumers of your amazing novel only read it in the last week at worst. So reams of recent-recap aren’t necessary. Yes, even if you did it in a clever way wherein the heroes restate the plot to a new character who genuinely needs to know – it’s still a boring level of repetition and can likely be cut. Get off that cliff, you stupid child! The original H&C webserial was one-hundred chapters long, requiring some kind of cliffhanger every 1500-2000 words. Some were big melodramatic notes (OH NO HE’S GOT A GUN) and others more downbeat ones (HOLY CRAP WHO COULD IT BE AT THE DOOR?) but either way, it spikes the pacing to build up to and hit a cliffhanger, the rhythm of the story mounts. When reading a whole novel in fewer sittings, feeling the narrative peak and sink and peak and sink every five minutes may get tiring. You want this to read like a novel rather than a collection of episodes, so some of the big OMG moments need to go, or the way they’re presented needs to change. This is an immediate, easy improvement in some places, because you kinda jerked the momentum to get a cliffhanger in, and harder in others because dammit, you liked that twist. Should I fire this canon? The broader question, really, is what kind of product you’re trying to end up with. If you’re entirely presenting the resultant book as a collection of your serial, you might feel okay just punching up the prose, removing a bit of redundancy and going with it. Especially if your serial is still ongoing for the foreseeable future - you don’t wanna mess up the canon, after all. However, if you’re aiming to transform your webserial into full-on novels like myself (and Virginia and fellow JukePop vet C.A. Sanders and many more besides….) then you may need to take a few breaths and fully absorb the oft-repeated Kill Your Darlings lesson. Which can mean cutting huge chunks or accepting that maybe a certain part doesn’t work with where you want to go, feels out of place or perhaps relied too heavily on creating cliffhangers for the serial format, and now seems like a runny, shouty, stabby mess. I deleted the entire ending to the third H&C arc and wrote a new one for its publication as Trapped In The Bargain Basement, and I do not regret it. It reads a lot better and although there was a part of me wanting desperately to adhere to canon, I’ve got a second chance here and would be foolish not to use it. That’s a big part of the mindset really - it’s an opportunity to take in any feedback you’ve had and improve. Of course, now I move on to the upcoming fourth Hobson & Choi book, hopefully coming in 2016, straight to book format without any serialisation first, so all these lessons become redundant. No more second chances. Damn. Virginia's Review: This third installment of the Hobson & Choi mysteries delivers just as much fun and whimsy as the first two books, but with the delightful addition of more wolfhound. My favorite thing about all three books is the characters and their engagement with each other. Bryan's character development is such that even secondary and tertiary characters come to life on the page and make you recognize them as people beyond the tropes they may or may not represent. The mystery isn't that mysterious in this episode, however it is more layered and multifaceted than one might initially suspect, and is sufficiently intriguing to keep one engaged to the end of the book. In addition, there are two romantic threads that are brought further to the forefront in this book add some additional anticipation to the story. Bryan seems ever willing to take a good hard look at how humans treat each other, be that through the lens of a teenager thrown suddenly into the world of organized crime, a middle aged man so used to atrocities he used to turn a blind eye to them and is only recently asking himself whether or not that was ok, or a dog that isn't sure why it used to be forced to swallow all the 'little suns' and then poop them out across town but is very happy to be with this new human who just lets him be 'dog.' Whoever's perspective we're following, there's a good chance that we are going to be forced to take a good look at our own privilege, even if we aren't forced to stare at it too long, and can safely return to pinning things on the 'bad guys' a few pages later. It's this odd but compelling mixture of dark humor and introspection that keeps me returning to Bryan's books. Overall, I enjoyed the third H&C book quite thoroughly and recommend it as wholeheartedly as I recommended the first two. I'm eagerly awaiting the next tome as it will be an episode I am entirely unfamiliar with. Brand new, and never before published in any way! Well what are you waiting for? Go buy it! And for my regular readers, please note that next week I will be guest posting on the lovely Maureen's Book Blog. I'll be relating a day in the life of a writer as compared to what the world thinks that looks like. 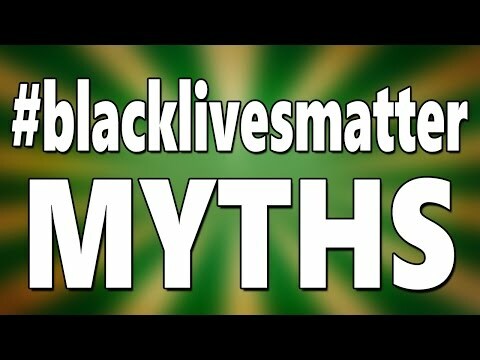 Meant to be both humorous and educational. So do keep an eye out for that.